For moderate to heavy bladder and per or bowel control protection. Medium, large and x–large briefs are now more absorbant. 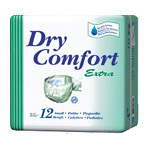 Contains targeted absorbency for greater security and skin dryness. Multi–strand elastic leg gathers provide leakage protection and more comfort. Latex free.